Don't really know what the Sunrisers batsmen are upto. Everyone are looking to swing for the big hits. Not connecting it from the middle. The inexperience in the batting clearly visible. Abhishek Sharma holes out to mid off. Abhishek Sharma departs. OUT! Rashid Khan comes in and walks out. Went for the almighty swing across the line to a length ball, is only able to get it to the fielder in deep midwicket. Horror show from Sunrisers. Morris picks two wickets in as many balls. OUT! Knocked'em over. Full and into the blockhole. Right at the base of the leg stump. Hooda is beaten for pace as his leg stump goes for a walk. OUT! Oh dear! Vijay follows Warner. Rabada has two in two and Delhi Capitals are right on top. Quick and was shortish in length, Vijay looked to flat-bat it for a massive hit over long on, gets the thick outside edge and goes straight up. Pant calls for it and takes it. OUT! KG Rabada strikes! He has got the massive wicket of David Warner. Rolled his fingers over the ball, to bowl it like an off-cutter. Warner toe-ends a slap down the ground and the mid off takes the important catch. How big is this for DC! FIFTY! Warner racks up another half-century in this IPL. He still has his task cut out, so the ceebrations are really subdued. Gets there in 46 balls. OUT! Keemo Paul outfoxes another batsman with his back-of-the-hand slower delivery. Bhui was aiming to give it almighty smash down the ground, ended up getting a thick outside edge. Axar Patel scampers from point, dives sideways to grab a fine catch. Third wicket for Paul. DROPPED! Colin Munro spills the simplest of chances. Mishra induces the false stroke with a flighted delivery as Bhui strikes it straight and flat to long off. Munro got to the ball perfectly was on the slide, reverse cupping and the ball goes right through his hands. OUT! A well-disguised back-of-the-hand slower ball from Keemo Paul brings Williamson's downfall. Was looking to drive down the ground but got timining horribly wrong. Lifting the ball for Rabada at mid off snaffle an outstanding diving catch. The combo of Rabada and Paul features in the second wicket of the innings. OUT! Keemo Paul provides the much-needed breakthrough for the Delhi Capitals. Bowls a fuller length slower ball, wide of off and Jonny Bairstow eyes the long off boundary. Doesn't get the timing right due to the change up. Rabada makes no mistake. With that it brings us to end of the second match of the double-header. It has been a long day and another one waits tomorrow as the World Cup squad will be announced tomorrow afternoon and followed by the big clash at Wankhede between Mumbai Indians and Royal Challengers Bangalore. I wish I can slide my way home just like Sunrisers did in the back end. Sigh. Do tune into Firstpost as we have some really good things lined up throughout the day. Thanks, once again. See ya! Paul: I just tried to adapt to the wicket. I just bowled to suit the wicket. This game is all about confidence. It is the biggest league in the world and why not enjoy it. I don't think so, it was going well and worked right. It is all about getting the condidence. Havent contributed with the bat and want to do more. This is for the friends, family and all my team mates. Thank you for the support. Turning out to a fantastic season so far Delhi. Can they sustain the momentum though? Kane Williamson, SRH captain: I thought in the first half with the ball it was a really good effort. Was a bare surface, probably a 160 pitch. We tried in the second half but never got going with partnerships. No, not any real complacency in a tournament like this. Any team on the table can beat anybody. For us, it's about executing our plans and play our style of cricket. Delhi adapted well on this surface and used their changes of pace. Sunrisers Hyderabad’s implosion was complete. From a comfortable 72 without loss in 9.4 overs, they slid to 116 in 18.5 overs. 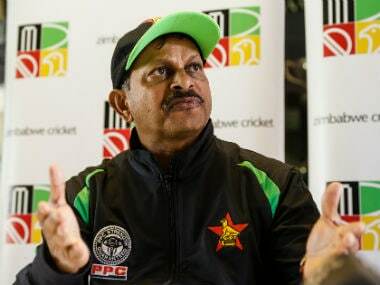 To say that they scripted their own downfall would be to unfairly deny Keemo Paul, the fastmedium bowler with the guile of a spinner, Kagiso Rabada and Chris Morris any credit. To be sure, Amit Mishra’s stifling leg-spin bowling played no mean role in the pressure that built up on the home batsmen during their attempted chase of 157 for victory. Delhi Capitals held their nerve during the Warner-Bairstow opening stand and picked up two points for their immense belief in themselves on a track that assisted the faster bowlers. Sunrisers Hyderabad will lick their wounds and wonder how they would plug the middle-order madness afflicting them. Delhi Capitals’ Kagiso Rabada, who had taken two catches to help Keemo Paul scalp Jonny Bairstow and Kane Williamson, returned to claim two big wickets with successive deliveries. David Warner became the first batsman to complete a half-century in the game on Sunday night but fell to Kagiso Rabada in the 17th over. The mounting pressure of the rising asking rate was too much to deal and Warner fell to a catch at mid-off. Off the next ball, Vijay Shankar top-edge a skyed catch to Rishabh Pant. Taking a cue from Paul, Rabada used the slower delivery to send Warner packing and take Delhi Capitals closer to a win. The man for the big occassion. Kagiso Rabada with a crucial over. Takes two wickets in two balls. The half side is back in the hut. Four runs and two wickets. SRH imploding here. Now 48 needed off 18 balls. Vijay Shankar strides out on the middle on the eve of the World Cup selection. Another probable Rishabh Pant is behind the wickets, will he fancy some chit chat? Meanwhile Keemo Paul continues his deception. Bhui falls, while Warner edges it to Pant only for the ball to bounce couple of yards before Pant. End of a sensational spell, four runs off his final over, finishes with the figures of 4-0-17-3. You can only admire at Keemo Paul’s skills with the cricket ball. He claimed his third wicket of the night to put Delhi Capitals ahead in the race for victory. With leg-spinner Amit Mishra contributing to the pressure on Sunrisers Hyderabad with his economical bowling – unfortunately, he could not latch on to a stiff return catch offered by David Warner – Paul was able to end Ricky Bhui’s uncomfortable stay in the middle. With David Warner finding the scoring touch, it promises to be an exciting finish but Delhi Capitals will have to believe that they can win this one. Warner is just switching his gears here. He is well aware of the chinks in Sunrisers' middle order and the former skipper has smashed couple of boundaries off Morris. Couple of times he must have had his heart up his mouth slapping the ball around aerially but he is gone away with it as the ball just about fallen short from the fielders. Eleven runs come from it and Sunrisers now need 61 off 36 balls. You could see that David Warner sensed that he will have to shift gears after the loss of his partners Jonny Bairstow and Kane Williamson to Keemo Paul’s wily bowling. With debutant Ricky Bhui visibly nervous in the middle and eager to make an impression, Sunrisers Hydrabad needed Warner to strike a few boundaries off the Delhi Capitals bowlers. Leg spinner Amit Mishra has bowled two economical overs, adding to the challenges of the home batsmen. FOUR! Short from Morris and Warner rocks back and pulls it away for a boundary to deep midwicket. Much-needed. Bhui misreads a googly from Mishra but the inside edge saves him. Adding insult to injury is the drop catch from Munro. Delhi Capitals cannot afford to spill chances here. Mishra must be disraught after luring the batsman into making a mistake, but unfortunately wasn't upported by his fielder. Four runs off the over. The ‘c Rabada b Paul’ line appeared on the scoreboard a second time in two overs, this time to dismiss Sunrisers Hyderabad captain Kane Williamson. It was another slower one that Keemo Paul sent down and drew a drive to mid-off where Rabada did well to take a lunging catch. It was a wicket that would fire the Delhi Capitals into believing that they could put the home side under greater pressure now. David Warner, scratching to find some luck with timing, will have to anchor the chase. Interestingly, Sunrisers Hyderabad decided to send young Ricky Bhui to join Warner, holding back Vijay Shankar and Deepak Hooda. Disaster is averted off the first ball as KW sends Warner back for the non-existent second run. Was a good call from the Kiwi. However, he is outsmarted by the guile of Paul couple of deliveries later. Delhi Capitals are right in it. Three runs and wicket of the opposition captain in the over. Ricky Bhui joins Warner. The stage is getting set for the fans to be drawn to the edge of their seats. Though Delhi Capitals needed till the 10th over to see the back of Jonny Bairstow, they were able to keep building some pressure on Sunrisers Hyderabad by keeping a check on their scoring rate. It was this slow pressure that forced Bairstow to drive a simple catch to long off for Kagiso Rabada to pouch and give Keemo Paul the first wicket. Paul was using a lot of the variations to keep the batsmen guessing and quiet. At the halfway stage, Sunrisers Hyderabad were 73 for one, falling behind on the asking rate. Just before the halfway juncture in the second innings Bairstow falls. Keemo Paul overstepps and has to re-bowl the fourth delivery. Warner doesn't quite bury the free hit as mistimes a full toss to long on for a single. Bairstow's departure brings skipper Kane Williamson to the middle opens his account with a single to long leg. Big over for SRH. These two are batting beautifully and pacing the chase perfectly. Axar Patel's over has been thrashed for 15 runs. FOUR! Again, too short from Patel and Bairstow is the beneficiary this time around. Goes back is crease and pumps it wide of deep midwicket fielder. SIX! Warner has been waiting for a gift all evening. Gets one from Axar and latches on it. Nothing delivery, to be honest, was halfway down the track which Warner would have slapped away in his sleep. Rocks back and sends it over deep mid wicket. Keemo Paul is introdced into the attack. One of his deliveries stays low and goes under Bairstow's bat, just past the offstump while another delivery simply rears of length to Warner. He was looking to work the ball on the leg side but got a leading edge that falls safe on the offside. The two-paced nature of the surface displayed none better than this over. Warner and Bairstow raise another 50-run stand. Spin. Axar Patel is into the attack straightaway after the strategic break. These two continue to make steady progress and have their roles defined nicely, the Englishman will attack, while the Aussie works the singles and the twos. Eight runs from Axar's first. FOUR! Bairstow goes for the cut with not a lot of width on offer, getting a thick outside through the vacant first slip region. No stopping that. Patel isn't impressed. Sunrisers Hyderabad openers Jonny Bairstow and David Warner showed they are prepared to buckle down and work hard against a determined, if not so effective, Delhi Capitals pace bowlers in the power play overs. They used a workman-like approach much of the time to rotate the strike while Bairstow was prepared to swiftly make the visiting bowlers regret their errors in line and length on a track that continues to offer bounce. Bairstow has outscored Warner 2:1 but Sunrisers Hyderabad will look for some acceleration from their batsmen now. Iyer continues to rotate his quicks here as Rabada comes back into the end. Change of ends for him. Bairstow flicks it to fine leg where Keemo Paul gets around just in time to keep it down to two wickets. Single for Bairstow off the final ball of the Powerplay. Delhi had raced past 50 at the same stage but had lost their openers. Tidy over from KG, giving away just four runs. Time out has been taken. Ishant is back for his third over. Warner has been unable to breakfree here, unable to middle his shots, while his partner seems to be batting on a different strip. Decent over from Delhi's persepctive six runs from it. Jonny Bairstow took on the responsibility of scoring at a brisk pace by striking Ishan Sharma for successive fours, including a superbly timed flick off a half-volley, and Chris Morris for a six in the straight field. The Delhi Capitals bowlers will be disappointed that they did not adequately test the Sunrisers Hyderabad openers, barring a couple of deliveries from Ishant Sharma that beat David Warner and Bairstow with late swing and bounce. Chris Morris comes into the attack, replacing countryman Kagiso Rabada. Well, that is awkward Morris' delivery stays low and Bairstow misses a swipe catching the ball just under his oompa loompas. Holds it for good 5 to 7 seconds. However, the next ball comes on nicely and flies off the bat down the ground, that was as classy as a shot is there in any form of the sport. SIX! Aggressive cricket at its best! Stand and deliver from Bairstow. Length delivery from Morris and that Bairstow launches it powerfully down the ground for a straight six. Top shot! Ishant Sharma is taken for couple of boundaries from Bairstow. He is such a fine nick that the margin for error against him is very little. This is a good start from SRH. 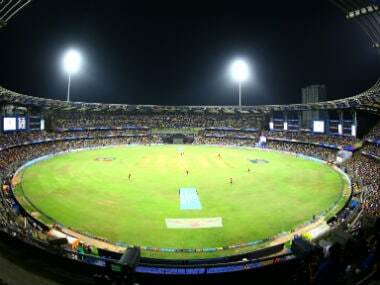 IPL 12 Match 30 SRH vs DC at Rajiv Gandhi International Stadium in Hyderabad: Delhi Capitals win by 39 runs! ALL OUT! It was only a matter of time. Rabada completes the formalities by going straight and full. Khaleel was looking to back away and get some bat but misses. Sunrisers lose eight wickets for just 14 runs. 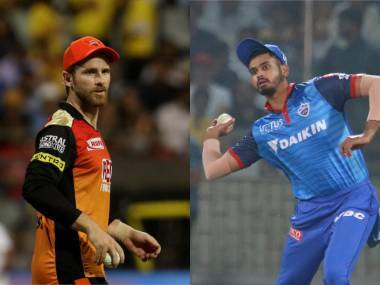 IPL 2019, SRH vs DC, Today's Match Preview: A confident Delhi Capitals, who are coming off from two back-to-back victories, will take on Sunrisers Hyderabad in match 30 of IPL 2019 on Sunday. 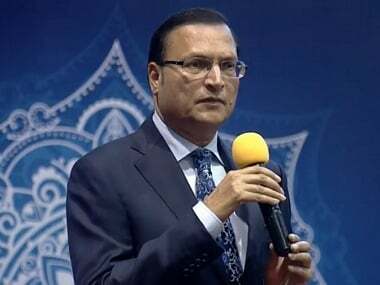 Sunrisers led the points table during the early stages of the season with three wins from first four matches but consecutive defeats against Mumbai Indians and Kings XI Punjab have pushed them down to sixth position in the standings. SRH are heavily dependent on their opening batsmen, David Warner and Jonny Bairstow, and poor form of their middle-order batsmen have exposed the chinks in their armour in last two matches. Another concern for the side has been its poor execution of bowling plans in death overs. 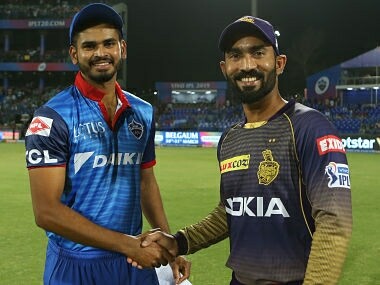 Meanwhile, DC are the team in form and will take the field after consecutive wins against Royal Challengers Bangalore and Kolkata Knight Riders, away from home. Opener Shikhar Dhawan was in top gear in DC's last match as he scored unbeaten 97 to beat KKR by seven wickets. Dhawan played for SRH earlier and has a good record at the Hyderabad ground. Shreyas Iyer would hope for another good performance by the veteran batsman. SRH won the previous match between these two sides this season by five wickets and DC would have revenge on their minds. In the 13 matches played between these two sides so far in IPL, SRH have won nine of them. 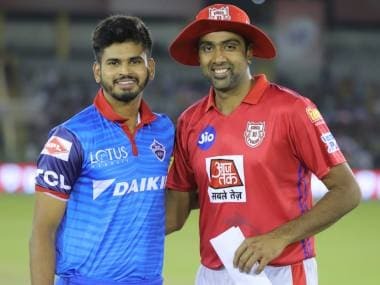 Delhi Capitals Team 2019 Players list: Shreyas Iyer(capt), Prithvi Shaw, Shikhar Dhawan, Rishabh Pant(wk), Colin Ingram, Keemo Paul, Axar Patel, Rahul Tewatia, Amit Mishra, Kagiso Rabada, Ishant Sharma, Hanuma Vihari, Ankush Bains, Harshal Patel, Manjot Kalra, Chris Morris, Sherfane Rutherford, Jalaj Saxena, Sandeep Lamichhane, Trent Boult, Avesh Khan, Nathu Singh, Bandaru Ayyappa, Colin Munro.